We typically only hear about instances when lightning strikes people and buildings. However, an arborist can tell you that trees are the most common victims. Most lightning bolts pass through trees on the way to the ground. This is because trees contain a lot of water and water is a better electrical conductor than air. The tree trunk in particular contains a high concentration of water near the cambium - just under the bark. As the electricity from the lightning surges through the water in the tree trunk, it causes it to boil explosively, blasting off the bark, and sometimes throwing pieces over a hundred feet. The best way to protect trees from a similar fate is to have lightning rods installed. The lightning rod is a simple device and is as effective at protecting trees as it is at protecting other structures such as barns. The metal of the lightning rod provides an even better conductor than the moisture in the trunk, so the lightning bolt is guided down to earth without injuring the tree. 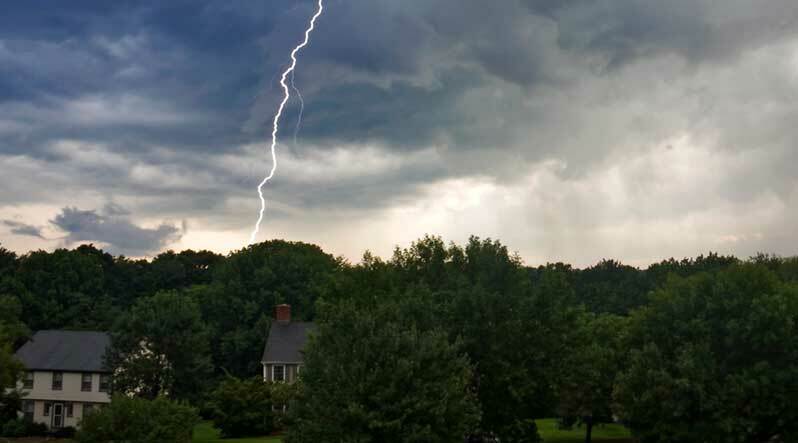 While it may be impractical to install a rod in every tree on your landscape, certain factors can help you narrow down the list of trees that must be protected from lightning.